The past few weeks have been busy. One of the interesting encounters that I had was with working on the Connector for Microsoft Dynamics – integrating MS CRM 2011 Online and Navision (NAV) 2009 R2. The best part is that the Dynamics Connector is FREE from Microsoft and is fully supported for production use. If the connector works good enough – who can complain right! So we needed to setup a Navision (NAV) to Microsoft CRM Online demonstration environment for a Bottle Caps Manufacturer customer. They are upgrading to NAV 2009 R2 and would like to take advantage of the FREE Dynamics Connector to provide simple integration and data synchronization between Microsoft Dynamics NAV 2009 R2 and Microsoft Dynamics CRM such as Accounts/Contacts/Sales Histories. Here is the link to the complete data mapping between CRM and NAV offer by the Dynamics Connector. This issue is caused by missing CRM form customizations needed by the Dynamics Connector. These missing customizations are setup in MS CRM Online after completing the “Microsoft Dynamics CRM Adapter Configuration” Wizard – a few steps after the ConnectorForMicrosoftDynamicsNav.zip solution import. 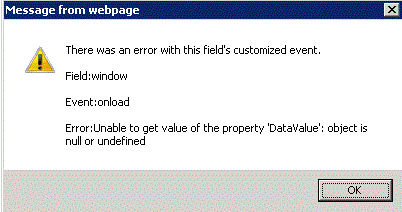 So this error message is normal if the CRM Adapter Configuration Wizard has not been completed yet. This entry was posted in Connector for Microsoft Dynamics, CRM 2011, CRM Online, Dynamics Connector, Microsoft CRM Integration, Microsoft Dynamics CRM, MS CRM, NAV 2009 R2, Navision and tagged ConnectorForMicrosoftDynamicsNav, onload error. Bookmark the permalink. Hi. 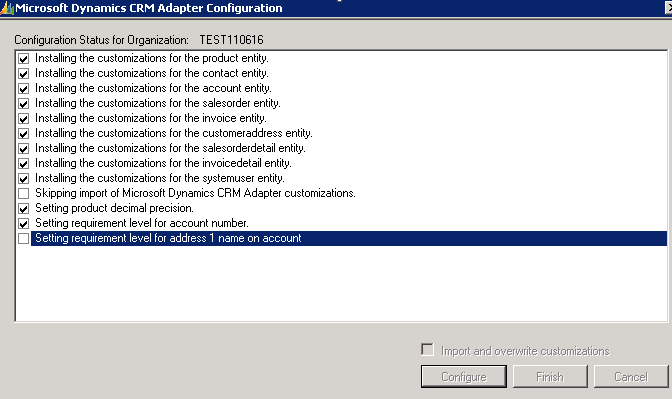 I am testing CRM 2011 and NAV connector to sychronize data between NAV and CRM. Have you run the CRM Configuration utility? The field is added by the utility and is related to this blog entry’s error. Congratulations about your great blog! Where can I download the ConnectorForMicrosoftDynamicsNav.zip to install in my CRM 2011 Server? The ConnectorForMicrosoftDynamicsNav.zip is available from the Microsoft PartnerSource site – or check with your NAV partner.